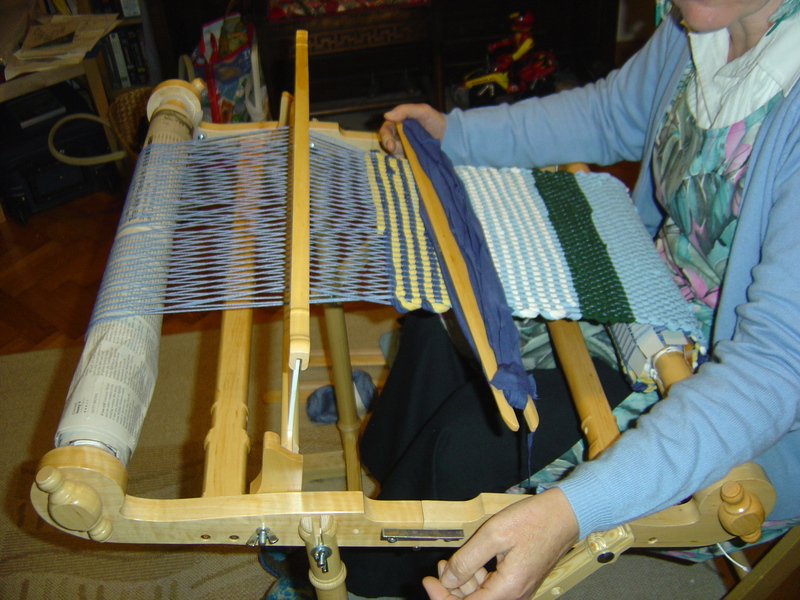 The Kromski is a great loom for taking to shows for demos, visiting friends or just sitting in the garden on a lovely day as it has its own stand which makes it very portable. For an eco, stretchy weft try cutting up t-shirts into strips which will weave up really quickly. As the body and sleeves of the t-shirt are already joined in a circle you just have to cut round and round and there you have it- lovely balls of jersey yarn. 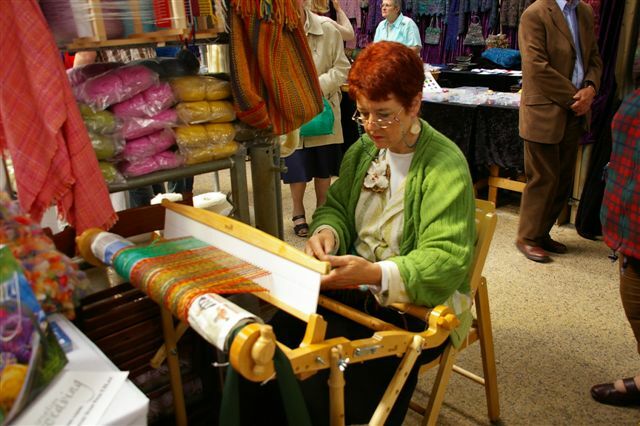 This loom also comes as a 16″ – 40cm width so if you don’t have much room at home this will still give you enough length and width to make interesting and wearable clothing. You can also make fun things for the home like these table mats which have good heat proof properties as well as washing well and looking good. You need a smooth cotton yarn for your warp which will complement your coloured t- shirts. Space the warp at 5 dents per inch or 20 dents per cm to allow the rags to pack down and give you a good solid fabric. This would be too tight and stiff for clothing but makes good strong bags as well as these lovely table mats. Where can I find the step by step instructions for making these placemats? 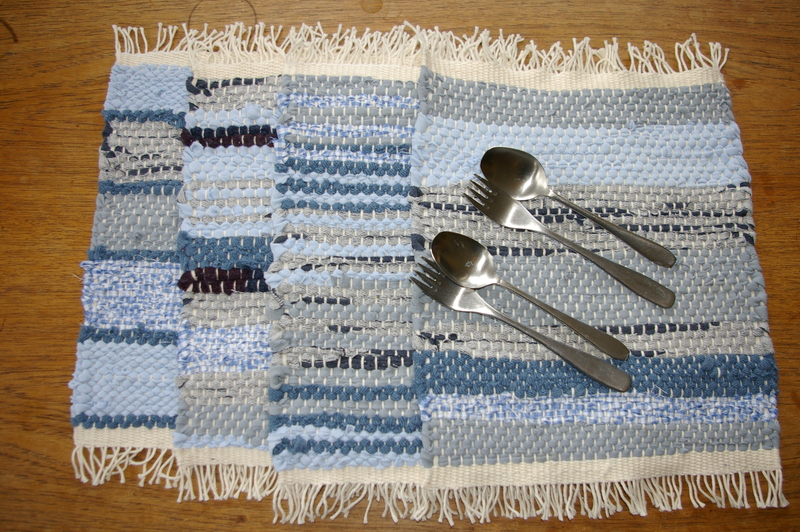 Hi Robin, These placemats were woven on a rigid heddle loom using a 5dpi (20/10cm) reed with a white DK weight cotton warp (15 wraps per inch) The reed was threaded up every hole and slot. 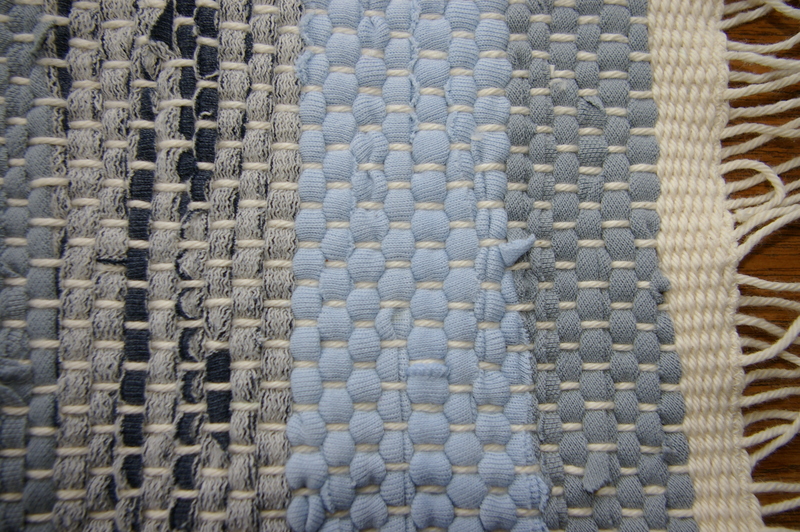 The weft was made from an assorted mix of blue fabrics cut up into 1/2″ (1cm) strips. You can see more about these and other projects in our book CREATIVE WEAVING. Glad you liked them and happy weaving. Where do I find the book and who are the authors? Hi Robin, CREATIVE WEAVING written by Sarah Howard and Elisabeth Kendrick is our second weaving book and we are the authors and this is our weaving blog. I think you can still find this book online with Amazon and also in Waterstones book shops. Glad you like them and happy weaving.